There is a little-watched and relatively obscure set of indicators produced by Thomson Reuters and Ipsos, called the primary consumer sentiment indexes. These provide a standardized approach to measuring consumer sentiment across a number of countries, and provide timely insight into consumer trends globally. With the release of the May data this week I thought it would be good to take a quick look at the key trends in global consumer confidence (I have aggregated these indexes using GDP weights to provide a global as well as EM vs. DM view). Basically, global consumer sentiment has held up surprisingly well, which is a positive sign. -The global aggregate index of consumer sentiment strengthened in May. 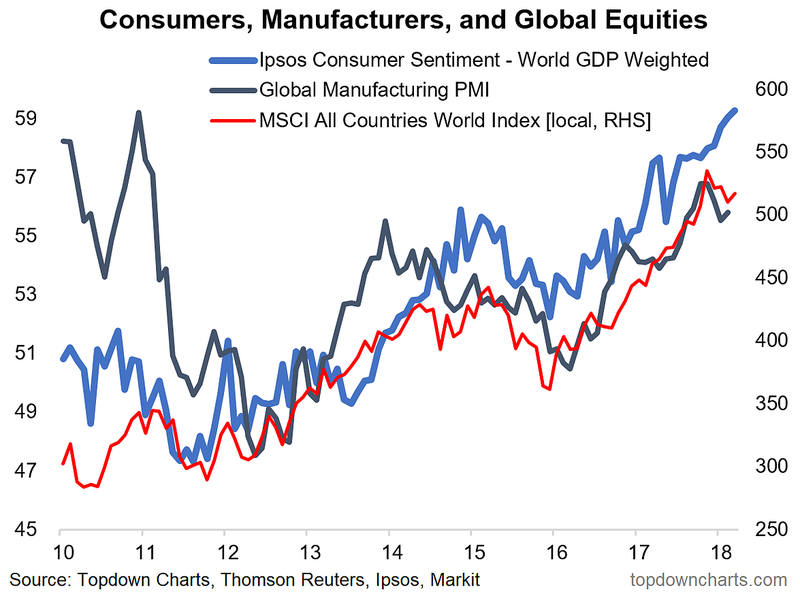 -Global consumer sentiment held up well through the global equity market correction and actually strengthened vs. weakening seen in the manufacturing PMI. -EM consumer confidence has been outperforming DM. -Overall it supports a bullish global growth outlook. 1. Global Consumer Confidence vs. PMI and Global Equities: The May round of the Thomson Reuters/Ipsos consumer sentiment indexes (which I have aggregated based on IMF calculated PPP adjusted GDP weights), shows that globally the consumer is still doing well and if anything is going from strength to strength. Interestingly, the global consumer confidence index held up well and actually strengthened through the global equity market correction and bucked the trend seen in the manufacturing PMI. So to my mind it is a nod to the underlying strength in the global economy. 2. 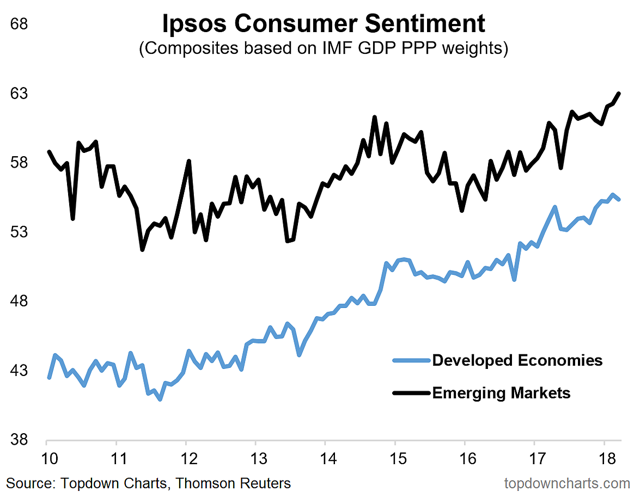 Consumer Sentiment – EM vs. DM: Looking at the split between emerging vs. developed economies, the same picture of an apparent structurally different level (EM generally stronger) continued, but in terms of the signal, EM has continued its strengthening trend and in the month of May outperformed DM. This one is also key as there has been some doubt around emerging markets as EM equities have seen substantial volatility and a reversal of previously hot fund flows.